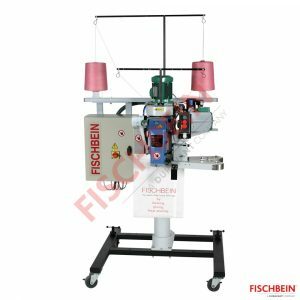 The sewing system offers various industrial features depending on the number of bags to be closed; the manpower, the skill of the operators, the degree of automation, the type of bags…from a manual operation up to a system with infeed for automatic handling. The sewing system MTR features the world famous Sewing Head 100 and takes advantages of its state-of-the art innovations. The sewing system MTR is used to close paper, polypropylene, or polyethylene (thickness +/-120 µ) bags. The already reshaped bag is introduced into the infeed which guides the bag to the sewing head. The sewing process starts when the photo sensor detects the bag. At the end the rotary knife cuts the chain. To have a smooth operation of the system, a conveyor is required. The conveyor can be controlled with a footswitch. Other models of sewing systems are available.